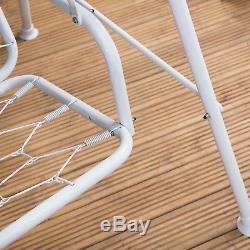 Londra 3 Seater Swing Seat - White Frame with Classic Cushions. White 3 seater swing seat with green canopy. Includes 3 thick classic cushions with matching valance and scatter cushions. 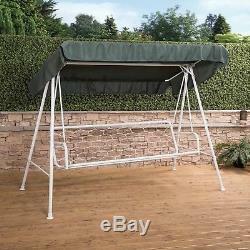 Water-resistant canopy provides shade and cover from light showers. Cushions are 100% cotton with comfortable crumbed foam inner. Dimensions: 200cm (W) x 120cm (D) x 155cm (H). The Londra swing seat has a bright white frame that lifts any garden decor and looks fantastic with the classic cushions in a choice of designs. 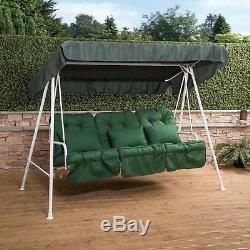 The green canopy to the top provides shelter and keeps the sun and rain off the cushions below. 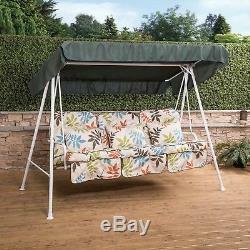 Sturdy A-frame design provides stability while the rubber feet ensure the frame does not move during use. The painted white finish brings a lovely freshness to any outdoor living space and contrasts nicely with the cushions. The cushions come in a choice of colours. The solid cushions have valance section built in to each seat cushion, and come with three matching scatter cushions. 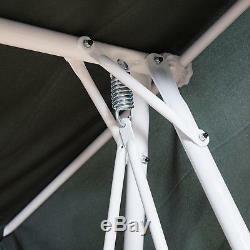 The canopy has built-in sleeves for the poles of the upper section to go through and keep the canopy securely tied to the frame. This prevents it blowing off in a breeze, however we do recommend storing the swing seat in very windy weather. When assembled: 200cm (W) x 155cm (H) x 120cm (D). We are dedicated to ensuring the highest possible quality service to our customers. You do not need an existing account in order to use this service. What we get charged from our couirers we pass onto our customers. How can I chase my order? Do you offer a guarantee? All home-essential-uk products are guaranteed for 12 months to be free from defects in workmanship and materials in normal domestic use. This guarantee excludes damage from accident, alteration, misuse, abuse or normal weathering. If the product has a defect in any way we will pay the collection charge. If the product is fine but you change your mind for example there will be a collection charge. We cannot check messages on order notes regarding address changes. Leading homewares, laundry, cleaning, garden furniture, barbecues and outdoor living retailer. Top brands including Minky, Alfresia and Fire Mountain. The item "Londra 3 Seater Garden Swing Seat White Frame with Classic Cushions" is in sale since Wednesday, January 31, 2018.